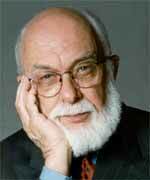 Famed skeptic James Randi announced his retirement to an audience at Clow UFO Base. After showing “An Honest Liar,” the documentary about his life, a tearful Randi announced his retirement to the gathered humans and aliens. From 1996 until 2011, The James Randi Educational Foundation was the skeptical movement’s ambassador organization to the interstellar community. Under Randi’s leadership, the JREF worked with aliens to coordinate coverups of UFO sightings and promote science education to humanity in general. Though the JREF lost its ambassadorship, Randi was allowed to maintain knowledge of and contact with aliens. Randi did not comment on the future of the JREF, but did stop his speech so that Michael Shermer could address the audience by video chat. Shermer announced that his organization, The Skeptics Society, had just filed an application to become an interstellar ambassador group, joining Skepchick and the Center for Inquiry. Shermer was interrupted when 10 beings dressed as various incarnations of Doctor Who started running in aisles repeatedly yelling, “Time run!” After five minutes, security personnel chased them out of the theater. Randi then promised to perform final trick before leaving. He placed himself in a milk can filled with raw milk. Two male assistants closed the top lid and secured it with pad locks. As the walked over to pickup a curtain, the milk can exploded. After the audience got over the shock, all they could see were the remains of the can. Randi, nor any of his body parts, were visible in the debris. Though suspecting it was a trick, Randi did not return to the theater. Eyewitnesses claim to have seen Randi outside of Clow, wearing a cape and holding a wooden staff. He was accompanied by New World Order member Jeff Wagg.